Holden, Mass. – Coming into Saturday's Central Mass. 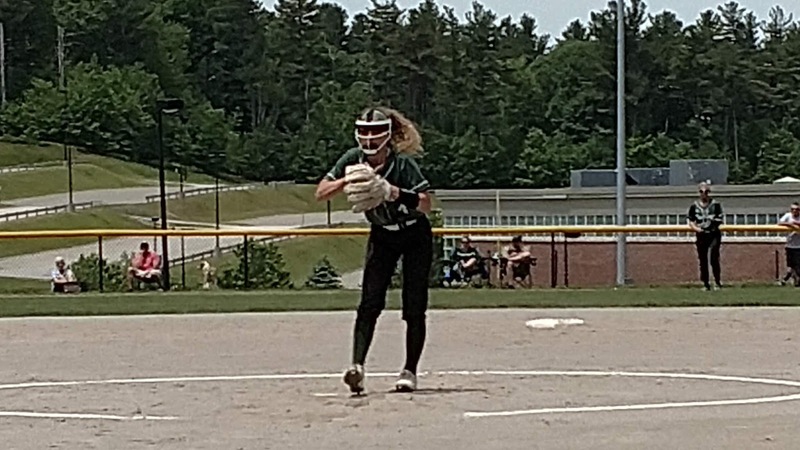 Division 1 quarterfinal, Courtney Lanpher's in facing Westborough, was to pitch to contact and allow her defense to handle most of the work. 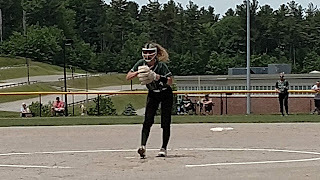 Instead, Lanpher, Wachusett Regional's junior ace pitcher, was on the mark throughout as she allowed just one hit while striking out 16 to lead the top-seeded Mountaineers to a 8-1 win over Westborough. "I wanted to pitch to contact and stay right around the strike zone," said Lanpher, who upped her record to 12-0. "But I ended up getting some calls and getting them to swing at pitches, so that is what I was continuing to aim for." Wachusett (21-0) moves on to the semifinal round where it will face No. 5 Shepherd Hill (12-9) Tuesday at Worcester State University's Rockwood Field beginning at 7 p.m. The Rams defeated Holy Name 5-1 in their quarterfinal contest. "Our regular season record didn't matter coming into this," Lanpher stated. "The regular season has nothing to do with the postseason. The playoffs is a whole different atmosphere so we wanted to start fresh today." Lanpher was brilliant from beginning to end with a dominating performance inside the circle. The right-hander fanned eight of the first nine batters she faced. But the Mountaineers, as they have proven all season long, are not a one-person show. The Mountaineers, who defeated Westborough 7-3 in early May, came through with 11 hits and took advantage of four Rangers errors to provide Lanpher with plenty of support. Wachusett, who lost to Milford in last year's state final, set the tone early by jumping on Rangers pitcher Cassie Kadish for three runs during its initial frame. With one out, Jordin Laraia smashed an opposite field triple into left and scored moments later on an error. After Ellie Moore reached on a fielder's choice, Reagan Lowe ripped a triple into the left-centerfield gap for the Mountaineers' second run. Paige Arvidson brought in Lowe with an RBI single to make it 3-0 Wachusett. Westborough showed a bit of life in the top of the third. A one out double off the bat of Rachel Bigelow gave the Rangers their first and only hit of the afternoon. With two out, McCarthy hit a sharp grounder to second that took a funky hop bringing in Bigelow to trim the deficit to 3-1. Shrugging off the run, the Mountaineers went back to work at the plate in the bottom of the inning. Griffin doubled with one out and Moore reached on a' dropped fly ball putting both runners in scoring position. A single up the middle by Lowe brought Griffin in with Wachusett's fourth tally. Arvidson then brought home Moore with a ground ball that was mishandled. Later in the inning, Emily Todorov lined a single into right that scored Lowe and Erin Hancock's lofted a sacrifice fly to make it 7-1 Wachusett. "We knew coming in that we were facing a very good team," Rangers first-year coach Kim Danish said. "I give a ton of credit to their pitcher. She was throwing gas. Were we intimidated? I honestly don't know. We did have a few long at bats by fighting off some pitches. But give credit to Wachusett for not letting our one run get to them." After their lone score in the third, the Rangers' bats fell silent thereafter. Lanpher continued to deal, setting them in order in the fourth, fifth and sixth innings, respectively. In the Westborough seventh, it managed to put a couple of runners on via an error and a walk with one out. But Lanpher was able to bear down by retiring Robinson and Kadish to close things out. "Courtney was hitting her spots early," said Wachusett first-year coach Jason Lanpher. "She was pitching strong. I've been apart of past associations when you come in thinking you are on the brink of disaster. But I don't have that feeling with this team. These girls are very confident and very mature. They are a psychologically strong unit of kids so I don't see them letting down at all."